Andrew Fleming of the University of Maine looks for an open teammate during a recent game against the University of Vermont at the Cross Insurance Center in Bangor. The junior forward from Norway tied an America East record with 18 field goals in Wednesday's victory at UMass Lowell and in the process became the first player in 20 seasons to make 90 percent of his field goals in a game when attempting at least 20 shots. Nobody said it would happen overnight. One year later, Barron is more confident that this rebuilding effort will see results, though many miles remain in that journey. UMaine finished the 2018-19 season with almost exactly the same record it had a year ago, 5-27 overall and 3-13 in America East conference play, compared to 6-26 and 3-13 last winter. The difference was, UMaine played only one non-Division I game this season instead of two during the previous campaign. UMaine was more competitive in more games this winter, with 12 losses — including eight in conference play — by less than 10 points and a 1-3 record in overtime. Both the promise of the future and growing pains of the present were noticeable in mid-January during back-to-back conference losses at home against two of the top four teams in the final conference standings, Hartford and Stony Brook. UMaine built a 33-24 halftime lead against Hartford, then rallied from an eight-point deficit in the final five minutes before falling to the Hawks 77-76 on John Carroll’s two free throws with 0.5 seconds left. Three days later, UMaine jumped out to a 16-point halftime lead against Stony Brook but lost 64-61 to the Seawolves, who won 24 games during the regular season (12-4 AE) to trail only Vermont’s 14-2 league record. But as was the case when UMaine lost its last seven games of the 2017-18 season, this year’s team also struggled late in the season. 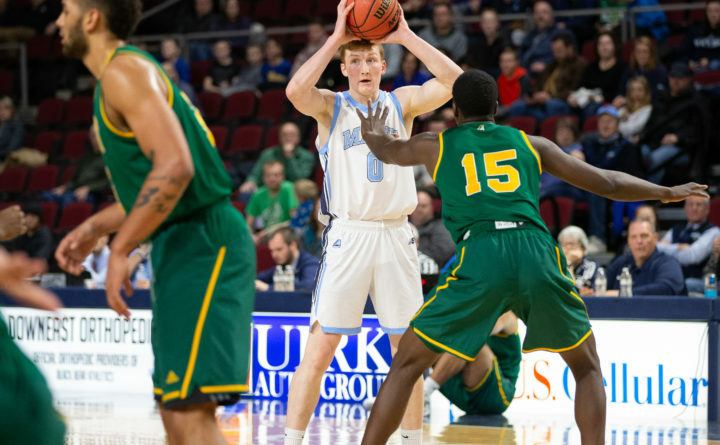 Including Saturday’s 73-57 loss at top-ranked Vermont in the America East quarterfinals — UMaine’s 14th-straight first-round AE playoff defeat and 15th straight postseason loss overall — the Black Bears ended this winter with nine consecutive losses. UMaine went winless during its second time around the conference schedule as opponents adapted to the team’s new offensive and defensive philosophies under Barron. And the Black Bears struggled to overcome late-season injuries that sidelined freshman point guard Terion Moss of Portland and junior forward Andrew Fleming of Norway, Maine, for three games each. Among the areas where the Black Bears must improve as they attempt to rise up the America East ranks from their eighth-place finish in the nine-team league this season are depth and shooting ability. While UMaine shot a middle-of-the-America-East-pack 43.2 percent from the field overall, it made a league-worst 31.1 percent of shots from the 3-point arc. The Black Bears also converted only 64.8 percent from the free-throw line while scoring a modest 62.1 points per game, eighth in the conference. UMaine played with a shorter bench than many opponents for much of the season, which likely contributed to its 4-10 record when leading or tied at halftime. That latter issue should be less prominent during Year 2 of the program’s journey under Barron. UMaine is expected to return five of its top seven scorers led by Fleming, who established himself as one of the more versatile frontcourt performers in the conference this winter. He became the first Black Bear named to the All-America East second team since 2013. Fleming led UMaine in scoring (13.8 ppg), rebounding (7.0 rpg) and assists (3.1 apg), and ranked among the top 10 in seven different America East statistical categories. Also set to return are UMaine’s two other double-figure scorers, guards Isaiah White (13.5 ppg) and Sergio El Darwich (10.4 ppg), along with 6-foot-8 sophomore forward Vilgot Larsson (7.0 ppg) and Moss, who had 37 steals and just 32 turnovers while averaging 5.7 points in 27 games — including 13 starts — at point guard. Nedeljko Prijovic, 6-8 junior forward, will become eligible after transferring from Texas State where he averaged 4.1 points and 3.4 rebounds in 30 games for the Bobcats during the 2017-18 season. Mykhailo Yagodin, a 6-5 sophomore guard, should add a significant perimeter shooting touch as he returns from a torn ACL suffered during the team’s season opener at the University of Denver. Solomon Iluyomade, a 6-7 sophomore forward, also will be back after suffering a season-ending injury in the same game. Another returning redshirt is 6-9 freshman forward Stephane Ingo, a former Gould Academy standout, while 6-8 sophomore Miks Antoms may be poised to become a bigger contributor in the post after two years of coming off the bench behind Fleming and the graduating Vincent Eze. UMaine added three international recruits last fall in Veljko Radakovic, a 6-9 forward from Novi Sad, Serbia, via Lee Academy; guard Ja’Shonte Wright-McLeish, a 6-4 product of Montreal; and 6-6 guard Peter “Peppe” Stumer, a teammate of Larsson for Team Sweden in last summer’s U20 European Championships.